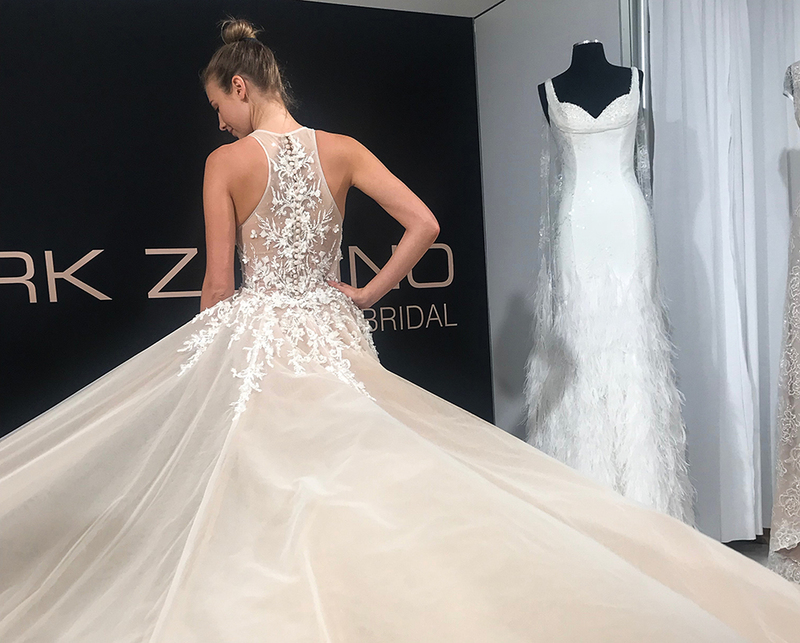 Each year bridal wear designers and retailers flock to New York City to view the year's top style trends on the Bridal Fashion Week runways. The series of shows provide a glimpse of the coming year and showcase the trends we might expect to see on 2019 brides. 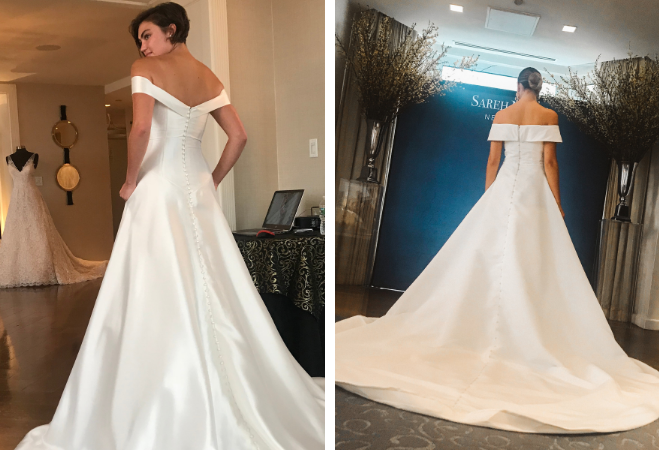 This year, we were lucky enough to get a sneak peek from the front row with the team from Mon Amie, Southern California's premiere bridal salon. They narrowed down some of their favorite styles and most noteworthy trends to share with us. From eyecatching embellishments to unique shoulder styles, see their top three trends below, plus find out which three designers they just can't get enough of in 2019. Designers enhanced simple or clean gowns with gorgeous ornamentations, such as three-dimensional feathers, bows or flowers. Blooms aren’t only being used in the bouquet anymore! Berta added delicate floral details to many of their classic silhouettes. 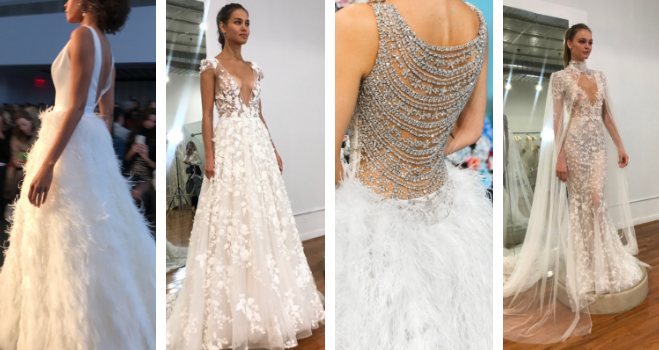 Ostrich feathers were seen in collections from Berta, Mark Zunino, & Justin Alexander Signature Collection. The off-the-shoulder trend that has been prevelant throughout the fashion world for the past few years is officially in for brides this season. Ballgowns, a-lines, and fit & flare gowns were all seen featuring this flattering neckline. Unique lace or fabric elements were used in juxtaposition with clean lines to add interesting texture to some of this year's gowns. Designers repurposed lace by hand cutting it to be rearranged in a new pattern. Other unique fabrics featured burnout details and bold textures. What surprised you at NYBFW? "The scope of what is available. Every designer had more of a focus on trends while still creating timeless pieces." Which of your favorite designers are you most excited to showcase in-store for the coming season? "Justin Alexander Signature, Berta & Berta Privee, Suzanne Neville." Mon Amie Bridal Salon has served as the West Coast's most elegant and premiere bridal salon for 40 years. We present our brides with an unparalleled selection of designer gowns in our spacious boutique. Out enthusiastic and knowledgeable staff are renowned for their exceptional personalized service.